Visit the ancient Royal Palace of Polonnaruwa which is the first set of ruins one would step in to on entering the ancient city. Built during the period of 1153-1186 by King Parakramabahu 1, the remains of the palace still seem impressive. The massive palace is an unbelievable masterpiece of the ancient past. The walls still remain high. The palace consists of an audience hall, swimming pool, sacred quadrangle, a beautiful garden and many other ruins all of which possess best archeological value. 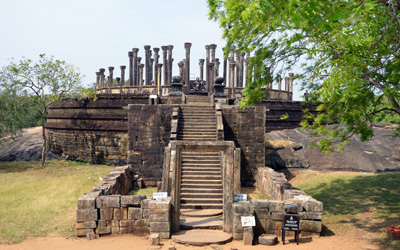 During the period of Polonnaruwa, King Parakramabahu 1 constructed the Vatadage to deposit the tooth relic of Lord Buddha and the arms bowl used by Lord Buddha. The stone carvings that decorates the two stone platforms that protects the stupa is still incompetent for its carvings. The lower platform can be accessed with a single entrance while the second platform with four entrances. The Stupa which is situated in the upper platform is covered with brick walls which also includes four statues of Lord Buddha. The architecture and the stonemasonry used for constructing Vatadage is beyond expectations compared to present. Originally declared as a wild life sanctuary in 1938, the park was declared as a national park in 1977. The park consists of shrub areas and evergreen forests making it ecofriendly and breath taking. May to October would be ideal to visit the park to view the gathering of the wild elephants. Some of the commonly captured sites within the park include, abandoned chenas, tropical dry mixed evergreen forests, various species of mammals including, elephants, sloth bear, samba and spotted deer, leopards, wild buffalos and pigs, various species of birds as grey horn bill, pigeon, brown capped babbler and amphibians and reptiles as tree frog, red lipped lizard, land monitors and mugger crocodiles. The national park lets its tourists gather bother educational and exciting experiences throughout. The Parakrama Samudra is a shallow reservoir which is a connection point of three separate reservoirs by narrow channels. The Samudraya was originally built to control the pressure on the main dam. Today only a part of the reservoir out of the five large reservoirs remain. The five reservoirs were named as Thopa, Eramudu, Dambuthulu, kalahagala and Bhuwewas. The dam of Parakramasamudraya is 14 kilometers long and 12.2 meters high. The reservoir spreads water over an area of 5350 acres with a depth of 25 feet. The temple takes tourists back to 1070’s during the period of Chola ruling Sri Lanka. The temple is the oldest building in Polonnaruwa and appears just the same as when it was built due to the fact that the construction of the temple was solely based on stones and thus remains the strongest and the oldest among ruins of Polonnaruwa. The temple is one of the most popular Hindu temples among the few. Observing the glory of Polonnaruwa to ones’ eye could be one of the best memories in your entire travelling life. Make this tour to Polonnaruwa a journey that educates and excites you.